A friend mentioned to me the other day on Facebook that it seems like all of Stephen King’s recent books are ones that he started to write when he was young but never got around to finishing. That’s true; the note at the end of 11/22/63 says that he started it in the early 70s but realized that it was far too ambitious for him to write at that stage of his career. (Actually, that would have been around the same time he wrote Carrie, so for all practical purposes he had no career yet, except as an obscure author of short horror stories.) He says much the same thing at the end of Under the Dome. And those final volumes of the Dark Tower series he wrote a few years ago are effectively the continuation of something he began writing when he was in college. I think King has realized that he’s at a crucial juncture in his life, where he’s still at the peak of his talents and still has all his wits intact, but that if he doesn’t write the works that were too ambitious for him as a young man they may never get written. So he’s buckling down, working with a research assistant (the same guy for the last two books; he gets an acknowledgment at the end of both), and making an honest attempt to write the best books he’ll ever write. On the basis of the last two, I think he’s succeeded. I think, though, that in many ways what 11/22/63 is is an homage by King to the period during which he was an adolescent. King is three years older than I am and would have been 11 in 1958, which is the year that the time hole leads to, and 16 in 1963, when Kennedy was assassinated. He describes the “land of ago” (as the protagonist calls it) with a certain degree of loving sentiment, acknowledging its flaws while simultaneously seeing it through the eyes of a child. I was around back then too and I’m not convinced that root beer really tasted better in 1958, but if King thinks it did, who am I to argue? (He may be right that cream was thicker and creamier.) I also don’t remember the world of the past as smelling that much worse than the world of today, though there were industrialized patches of it that did and King may have known some of those in Maine. The end of the book brought tears to my eyes and it’s hard to believe there are any readers of any age who wouldn’t react similarly. Granted, it wasn’t hard to figure out during the last 100 pages or so where King was headed — I guessed the broad outline without getting the details — but it’s the details that matter. I think he may lean a little too hard on the time paradox thing and could have had a similar ending without need for the “Green Card Man,” but I like his idea of the past as something that fights attempts to change it and that can injure, maim or even kill anyone who tries. There are some slow patches in the middle of the book but I think that’s because King isn’t really writing a suspense thriller here; he’s writing something more deeply sentimental and personally meaningful. Slow patches or no, the last 100 pages are as readable as anything from Under the Dome and if these should turn out for some reason to be the last two books King writes (which I certainly hope they aren’t), they’ll stand as a terrific monument to a writer who could have started resting on his laurels and royalty checks two or three decades ago yet just insists on becoming better and more ambitious instead. 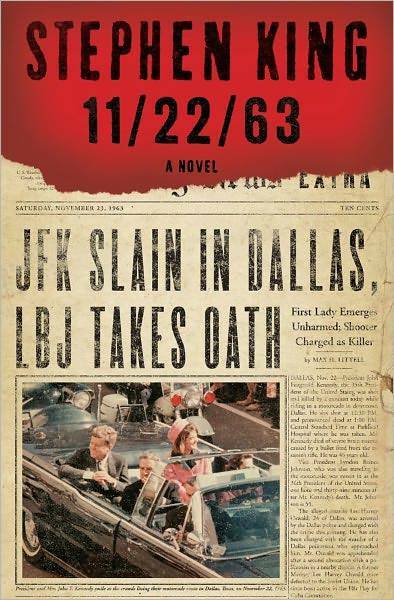 Posted in 11/22/63, book reviews, books, kennedy assassination, reading, science fiction, Stephen King, thriller and tagged 11/22/63, book reviews, books, kennedy assassination, reading, science fiction, Stephen King, thriller. Bookmark the permalink.